measures on his own countrymen to even notice. Only a few days after one of Spain's biggest banking groups went cap in hand to the Spanish government to ask for a €19bn bailout, the Spanish Central Bank revealed the astonishing level of capital flight out of Spain for the first three months of the year. The figures revealed that €97bn flowed out of the country between January and March 2012, representing 9.2% of Spanish GDP (based on the 2011 figure of €1,051bn). The data for April and May isn't even in yet, but given the absurd levels of economically destructive austerity being voluntarily inflicted by Mariano Rajoy's right-wing "Popular" Party (in order to prevent the national humiliation of accepting European Central Bank bailouts and austerity measures) and the enormous scale of the Spanish banking crisis it would come as no surprise at all if the scale of Spanish capital flight had intensified further over the last two months. To put the mind-boggling level of wealth flowing out of Spain into perspective, is only two weeks since the Daily Telegraph described the €4 billion a week in capital flight out of Greece in the wake of the democratic uprising against austerity as a "tsunami". If the flow of €4bn a week out of the Greek economy over the course of a few weeks is being described as a "tsunami" what on Earth could be an appropriate metaphor for an average of €7.7bn a week pouring out of the Spanish economy over the course of an entire economic quarter? A "megathrust tsunami"? A "meteor impact tsunami"? One of the most remarkable things about the Eurozone crisis is that economic difficulties in one or more of the Eurozone nations doesn't even seem to have been considered as a possibility by the ruling technocrats, hence the lack of coherent contingency planning. 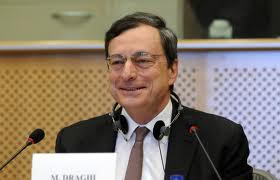 The traditional consequences of economic turmoil and large scale capital flight have been devaluation of the currency and depreciation of asset value, however the first consequence is not possible within the Eurozone economic area given the single currency. The ECB have repeatedly stated that they will not even consider a slight devaluation of the Euro through quantitative easing or changes in the extremely low interest rates they insist on maintaining in order to keep inflation down to the arbitrary "ideal level" of 2% they have set for themselves. Without currency devaluation, the socio-economic consequences of Spanish asset depreciation in combination for the brutal levels of self-inflicted austerity are going to be extremely severe. A lot of economics commentators have drawn parallels between the Spanish situation and Britain and the gold standard in the 1920s, however a much more recent and apt comparison can be made with the former Spanish colony Argentina who spent the 1990s enacting neoliberal reforms at such a pace that they became the poster boys of the IMF and pegged their currency directly to the US Dollar, meaning a complete loss of monetary autonomy, which creates enormous constraints on fiscal policy. The IMF admitted as much in their Lessons from the Argentine crisis review in which it was noted that “A currency board [currency peg] puts much more stringent demands than other regimes on fiscal and financial policies, as well as on the flexibility of trade and the labor market.”. Spain has undergone a similar process, the European Union is built on a foundation of "orthodox neoliberal" pseudo-economics and Spain effectively ceded their monetary autonomy to the ECB when they joined the Eurozone, meaning that their fiscal policy is heavily constrained by the monetary policy decisions of the ECB. Both experiments in neoliberalisation and loss of monetary and fiscal autonomy resulted in economic meltdowns. The Argentine economy tanked in 1999 leading to a vast scale of capital flight, the eventual breaking of the tie to the US Dollar and the biggest sovereign default in World history. The Spanish economy tanked in 2008 when the Spanish property crisis hit and the scale of capital flight is indicating that "the markets" are beginning to see a Spanish Eurozone exit and default as almost inevitable. There are two positives to this comparison: Argentina managed to rebuild their economy by paying off the IMF and tearing up the IMF handbook of socially and economically destructive ideologically driven pseudo-economics they force upon recipients of their loans through neoliberal Structural adjustment conditions. Once they were rid of the toxic IMF ideology they could introduce tried and tested growth based strategies, such as taxing capital flight in order to reinvest in fiscal multipliers such as infrastructure projects, welfare payments, house building and education, resulting in a 9% of GDP per year growth rate between 2002 and 2009. The other positive is that the ECB are not a totally disinterested party like the United States Federal Reserve were in Argentina's case. There is still time for the ECB to come to their senses and adjust European economic policy to prevent the creation of a socio-economic catastrophe triggered by the economic annihilation of the fourth largest economy within their jurisdiction, resulting in the almost certain breakup of their Single European Currency dream. 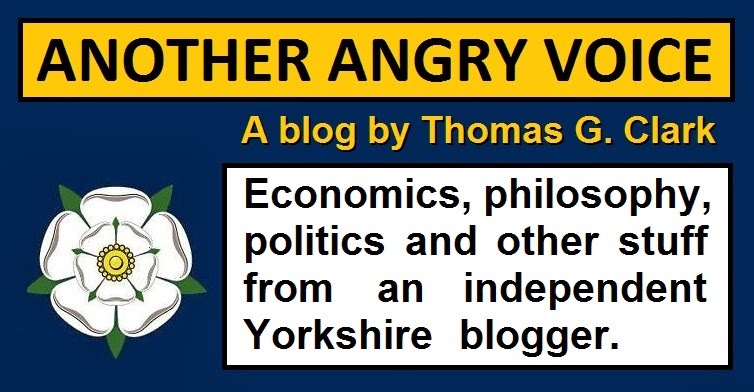 coherent, tried and tested economic recovery strategies? It was hardly surprising that the ECB refused to change pan-European economic policy because of the economic woes of Greece, a relatively small country (2.65% of Eurozone GDP) on the European periphery that "cheated their way in" by employing Goldman Sachs to "cook their books" in order to gain access to the Euro club in the first place. 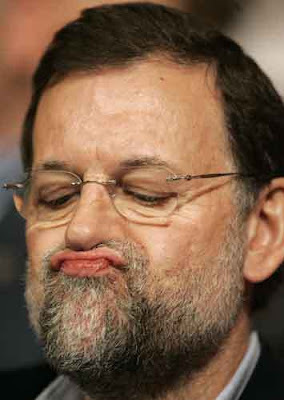 However failing to intervene to prevent a socio-economic catastrophe in Spain, the 4th largest economy in the Eurozone (almost twice the size of the Netherlands in fifth) which makes up almost 12% of Eurozone GDP and was actually outperforming Germany by many economic indicators as recently as 2007, is beginning to look like feeble minded political inertia. Of course providing direct assistance to the Spanish when they refused to do so for smaller economies such as Ireland and Greece would be a very public u-turn which would be spectacularly unpopular with the the Irish and the Greeks who were made to suffer years of punishing austerity measures as the vast bailout funds were used almost exclusively to support the financial sector creditors of these countries. It would signal the end of the road in the careers of many an unelected European technocrat and for Angela Merkel, the most visible democratically accountable austerity pusher. On the other hand if they don't intervene directly and stick with their catastrophically unsuccessful strategy of inflicting neiliberal reforms under the guise of "austerity" and using vast bailout loans to fund payouts on what should have been losing financial sector bets (on Greek, Irish & Spanish government bonds) in order to prop up the utterly dysfunctional neoliberalised financial sector they have created, the Eurozone meltdown begins to look almost inevitable. It seems that by maintaining their policies of austerity and bailouts instead of direct investment and coherent economic growth strategies, the Eurozone technocrats may be only acting out of ideological determination to perpetuate their utterly discredited neoliberal pseudo-economic theories at the expense of everybody else in order to preserve their own short term career interests. Jobs they could hardly keep upon the admission that their entire strategy so far has been nothing more than a sequence of terrible economically destructive mistakes. 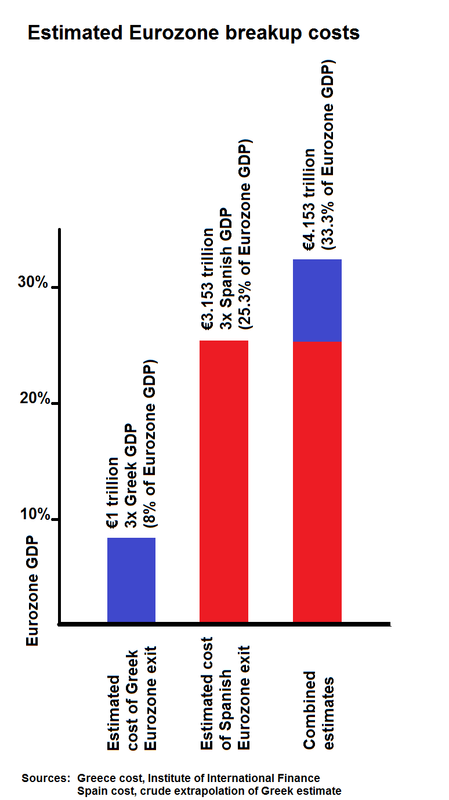 If worsening socio-economic conditions force Greece to bail out of the Euro, the scale of the economic damage has been estimated by the Institute of International Finance at a potential €1tn (or almost exactly three times the size of the entire Greek economy €329,9bn GDP). It is conceivable that the Eurozone could survive an economic catastrophe reducing the entire Eurozone GDP by over 8%, however using the same rule of thumb calculations to extrapolate the potential damage of a Spanish exit (three times Spanish GDP) gives us a ballpark figure of €3.153 trillion, or 25.3% of Eurozone GDP. Add this estimate to the estimated 8% of GDP annihilated by a Greek exit and we have a potential pan-European economic meltdown costing almost exactly one third of Eurozone GDP! Providing direct assistance to Spain would be a massively controversial u-turn, but what does it say about the Euro tchnocrats at the ECB and European Commission if they are unwilling to intervene to protect the fourth largest economy in the Eurozone from socio-economic meltdown? It also provokes the question of who's interests they are actually serving or whether they are serving anyone's interests at all by sticking with their catastrophically broken neoliberal economic models? If things do play out like this, resulting in the almost unimaginable socio-economic chaos of a full scale Eurozone meltdown, then the ECB's hard line stance against direct intervention is certain to be cited by future generations of economists and historians as a case study in unforgivable political inertia.